When a photo of Melanie Darnell (aka fitmomma4two) enjoying a placenta smoothie popped up on my Instagram feed one day (in spite of health being one of my highest priorities) I wasn’t sure I could stomach drinking my own. For the record I really admire Melanie and her decision and were it not for her post, the idea would not have been on my radar. Pregnant with my second child, the private midwife I engaged raised placenta encapsulation when we were discussing my birth plan. The idea of taking capsules of my dried and ground placenta was a far more palatable idea for me. I did some research and then decided I wanted to go ahead. I had no difficulty in locating a doula, who specialized in placenta encapsulation in Melbourne, where I’m based. I was actually surprised by how many doulas and midwives were offering this service. In the experience of Melbourne based doula, Felicity Meisel, of Doula by Design (who I used) and doula, Shanay Hall of Shanay the Doula, based in Germany, the majority of the women they work with will request encapsulation. I was sent a very detailed pack of information by Felicity covering everything from the health benefits to practical steps after delivery. There were several forms to complete including my preferences in relation to the process (Traditional Chinese Medicine or Raw method) and the type of capsules. Felicity offered two types of capsules of different compositions. One was a gelatin capsule, red in colour and opaque – it is flavoured, with additives, but it means that if you are uncomfortable seeing the placenta powder, you would go with this capsule. The other one is vegetarian, with no colourings or flavourings. I opted for the vegetarian option. There are no long term clinical studies as to the health benefits of consuming your placenta but as Felicity explains “anecdotal evidence suggests increased milk supply, increased energy levels, reduced blood loss, and general positivity and wellbeing”. Shanay says of the health benefits “I think the main thing is bringing about a smoother transition to motherhood. It can help restore your iron levels. No sleep and low iron are significant factors in postpartum depression”. The only possible downsides to consuming your placenta can be an oversupply of milk and energy levels which may be too high. These issues can be addressed as Felicity explains in saying “The increase in milk can cause an oversupply, so clients should be aware of the signs and symptoms of mastitis. As energy levels are increased, it is recommended not to take the capsules too late in the night, which may keep the client awake when they should be sleeping”. Before the process began, I was required to provide health information and copies of blood tests for Felicity to assess my suitability for encapsulation. Most mothers are able to have placenta encapsulation. The exceptions in Felicity’s practice are where recreational drugs have been ingested post 30 weeks gestation, clients have had a uterine infection during pregnancy or are undergoing cancer treatment. Shanay adds she would not encapsulate for mothers with blood borne illnesses. The public hospital where I delivered were very supportive of my choice and put my placenta on ice until it was taken homeby my Husband in an ice box. Felicity gave the option of having the placenta collected from the hospital or home. In my case it was collected from home. The process for encapsulation involves the placenta beingwashed and sliced, (the Chinese inspired method includes a steaming process) then dehydrated. Once it’s fully dried, it is ground into powder, and empty gelatin or vegetarian capsule casings are used to encapsulate the powder, into an easily digestible form. A few days after the birth, when I was home from hospital, several jars of the capsules were delivered to my door, together with some more information and some beautiful art work created from my placenta. Consuming your placenta is not a new practice. “Placentophagia (eating ones placenta) has been around for thousands of years, and has been used in traditional Chinese medicine for centuries to treat fatigue and assist with milk production. Most mammals will consume their placenta after the birth of their offspring” says Felicity. 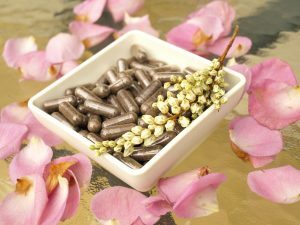 Placenta encapsulation is becoming more common in Western culture with some high profile mamas publicly sharing their experience. In Shanay’s experience the practice is becoming more widely known of and requested. “More woman are becoming aware of their options. Most of my clients are second time mums and they had nothing like this with their first baby. Some celebrities are also doing it, but you have to be careful not to do it just because a celebrity did it.” If it is something you are considering Shanay suggests directing anyquestions to a professional encapsulation specialist near you and new mothers around you who have done it about the pros and cons. Eleven months post-partum I’m still taking the capsules. My own experience has been that my milk supply has been consistently high and energy levels also good (all things considered!). As someone who had very low levels of iron during my pregnancy I was pleased this was listed as a benefit. I would definitely recommend the practice to expecting mums. Based on my experience, there is a great upside and no real downside. Prue Henschke, mama of two boys, aged 1 and 3 years, yogi, meditator, beach lover, traveller, newbie blogger, lawyer. Based in Melbourne, originally from Teresa’s home town of Adelaide.